Mort Kunstler Handsigned & Numbered Limited Edition Print:"Valor in Gray"
Image size: 14 3/4 " x 23 "
About the Print:The more I study the American Civil War, the more I am impressed by the courage demonstrated by Americans on both sides. A classic example occurred at the Battle of Fredericksburg. Northern troops in the Army of the Potomac made repeated assaults over the wide-open killing fields below the Confederate line on Marye's Heights. 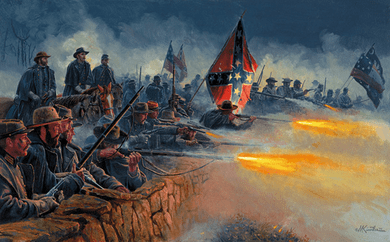 That's what I tried to portray in Courage in Blue, which shows the 20th Maine charging up the hill in the thick of fighting - led by Lt. Col. Joshua Chamberlain. But what about the men on the other side? I kept thinking about them as I painted the 20th Maine. They faced a superior force composed of the finest army at the time - and they held their ground and drove back those grand legions in blue. This historical event is re-created in the Ron Maxwell motion picture Gods and Generals in a vivid, moving episode, and I am honored to be the official artist for Maxwell's latest motion picture masterpiece.